Own your Ford Aspire & Next Gen Ford Figo for just 6.99 rate of interest (ROI). Else get 4 years extended warranty + 4 years scheduled service plan. 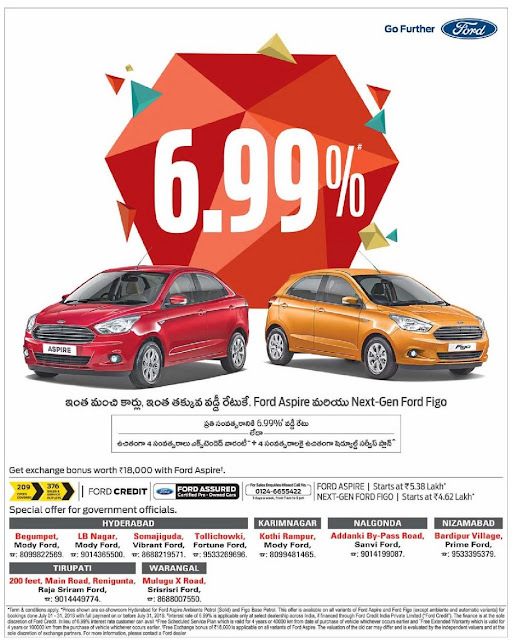 Get exchange bonus worth Rs 18,000 with ford Aspire. special offer for government officials. Click here to get more Cars offers, Bikes offers, Lowest down payment offers, Lowest EMI offers, Festival car discount offers, Cars discount benefits, Free insurance, Zero down payment offers.